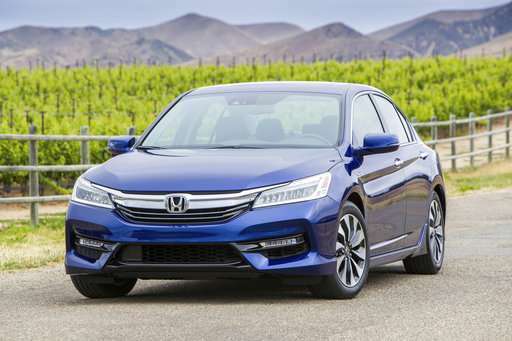 The new Accord Hybrid showcases how Honda engineers coaxed more power out of the gas and electric parts of the powertrain—a combined 212 horsepower. The 16.1-foot-long sedan starts from stops quietly and more quickly than expected, thanks to the 232 foot-pounds of torque it gets from the electric power system. The new Accord Hybrid's 2-liter, double overhead cam, four-cylinder engine kicks in over time—sometimes not until the car is near 60 mph—unless the car is in EV Mode, which keeps it silent and moving on electric power until the lithium ion battery is depleted. When that happens, the car automatically starts the 2-liter, gas engine to continue the drive. At this point, the electric power works predominantly by mixing and matching with the gas power. BASE PRICE: $29,605 for base model; $32,905 for EX-L; $35,955 for Touring. TYPE: Front-engine, front-wheel-drive, five-passenger, gasoline-electric hybrid, mid-size sedan. ENGINE: 2-liter, double overhead cam, Atkinson cycle four-cylinder with i-VTEC mated to two electric motors and a 1.3-kilowatt hour, lithium ion battery pack. MILEAGE: 49 mpg (city), 47 mpg (highway).